Public relations and social media can be the difference between being a well recognised expert and thought leader in your niche and just wishing you were. From Unknown To Expert delivers a comprehensive, step-by-step framework that will skyrocket your personal brand into the role of recognised expert and thought leader. Enable amazing new opportunities that you never even dreamed of. In From Unknown to Expert, Catriona Pollard shares her personal story and the challenges she has faced moving from unknown to expert. From this place of authenticity, she encourages people to take action and have the confidence and skills to be the recognised expert they ought to be. Catriona generously reveals the inside knowledge, tools and tactics acquired over 20 years of helping other people get into the spotlight. This book is perfect for anyone wanting to move from unknown to expert including: entrepreneurs, business owners, managers, CEOs, topic experts, coaches, consultants and anyone wanting to achieve the role of a recognised expert and thought leader in their field. Packed full of easy to use templates and examples, From Unknown to Expert shares a framework that will give you the confidence and skills to get you the media coverage and community you deserve. Fast track your journey from unknown to a recognised expert and thought leader! 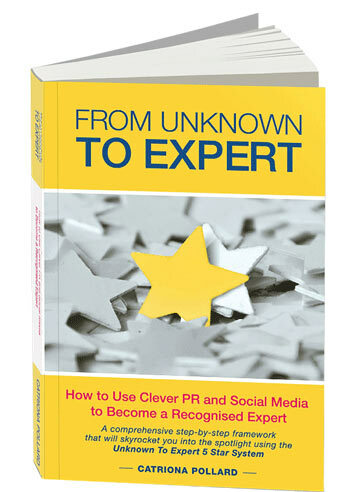 Buy Catriona’s book From Unknown To Expert: How to use clever PR and social media to become a recognised expert. Click the Add to cart button below to buy the paperback. Receive 32 BONUS Action Steps for free to help you immediately hit the road running on your journey from Unknown to Expert! Download today. In From Unknown to Expert you’ll get access to Catriona Pollard’s proven Unknown to Expert 5 Star System that will skyrocket you into the spotlight and drive sales. Read more about the proven Unknown to Expert 5 Star System. Accelerate your outcome by getting the Acceleration Pack and gain immediate access to 73 of Catriona Pollard’s own personal templates and examples of media pitches, media releases, blog posts, social media calendars (even media and blogger lists). 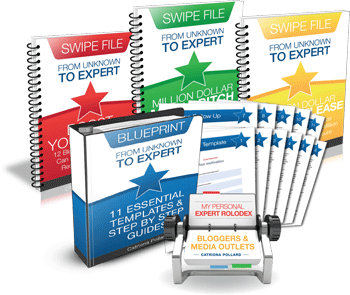 These are the very same tools Catriona has personally used to generate massive media coverage for herself and clients over the past 10 years – so you know it works! Buy the Acceleration Pack at www.UnknownToExpertFaster.com – it’s more than $2000 value for just $97. And it’s available for you to take and use, model, copy – basically whatever you need, to help you accelerate your journey from Unknown To Expert.